The Hutu and Kawa picture books, written and illustrated by Avis Acres, were popular in the 1950s. A strong ecological message underpinned the series. It starred two 'pōhutukawa fairies' who Acres first created for a comic strip that was published in the children's pages of the New Zealand Herald. The picture books were published by A. H. & A. W. Reed. 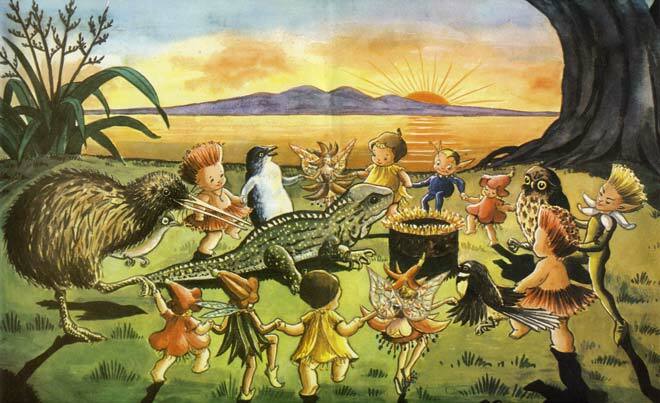 This charming scene is from Hutu and Kawa meet Tuatara, which was first published in 1956 and republished in 1990.